Win the Utilities Contract. Then Manage the Project. Win and manage utility projects using Projstream’s integrated estimating, pricing and earned value management tools. BOEMax in an all-in-one estimating and pricing tool. It's perfect for utility firms that need to quickly send out multiple versions of an estimate. Import takeoff data: Quickly import your quantities with hierarchies, units of measure identified and related labor and productivity measures. Import, parse and map requirements: Save time by automatically importing and parsing a lengthy requirements document in seconds. Then you can map it to the Work Breakdown Structure (WBS). Searchable estimating process library: Quickly create accurate, credible estimates using historical data. Just search the BOE library to leverage existing estimates at a project, Work Breakdown Structure (WBS), or task level. Or pull from your previous estimates to create even more accurate estimates. Takeoff search capability: Improve your credibility and traceability by searching the entire database for prior estimates and actual performance based on keywords, just like Google. Once you find the estimate you want to use, select it and reuse it and apply a complexity factor if necessary. Workflow queues and management: No more guessing with who is doing what. With workflow queues, work items automatically shows up in your estimator's queue until they take the required action. Then the item moves to the next responsible person. Full cost and pricing capability: Use this wizard-driven feature to build cost rules into your craft labor categories so if you enter labor hours your output can be full labor cost. And if you put in material quantities or material dollars, the output is material or non-labor cost. Hierarchical Bill of Materials (BOM): Modify a parent-level quantity, and it will flow relationally to the children. So you can quickly update and create multiple estimate versions while keeping your pricing accurate. Rich text documentation and reporting: Create documents with or without rich text templates for repeatable use. This could include information such as basis of estimate, risk, assumptions, statement of work and more. 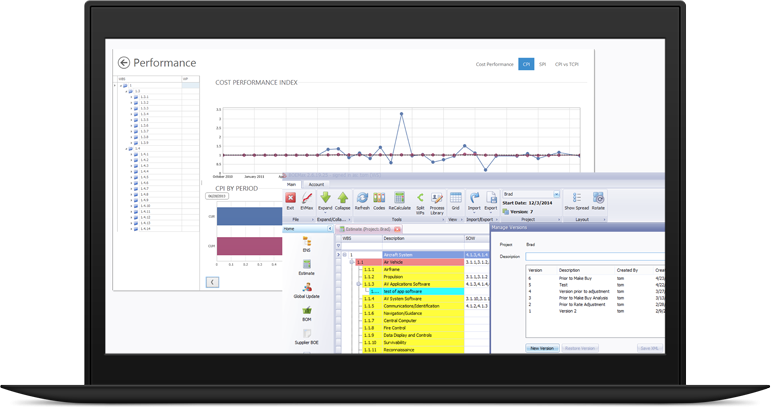 Exports estimate data to EVM software: Once you win your contract, it's time to manage project performance. BOEMax helps you get started day 1 by exporting estimate data to EVM software like EVMax or Cobra to create a budget baseline. Makes rolling wave planning a cinch: As the project progresses and your budget changes, you can make updates in BOEMax and push them to EVMax. Need to get an estimate out ASAP? We can customize BOEMax to your bid by setting up templates in the process library or common installation material and related labor. EVMax is an earned value management tool that keeps your utility company's project on track with customer support that resolves issues within 24 hours. Integrate with MS Project and Primavera: Integrate the time-phased budget baseline from either MS Project or Primavera. Also map just a part of the plan for rolling wave planning. Import your estimates from BOEMax: Forget copying and pasting estimate data. Instead, transfer it directly from BOEMax to EVMax to begin the baseline setup. Then use BOEMax as an ongoing platform for rolling wave planning. Manage workflow queues: No need to be a micromanager. Work items will show up in users' queue until they take the required action. Then the items move to the next responsible person. Contract budget baseline log: This log will support and balance your IPMR report by keeping track of contract and internal changes on a month-to-month summary basis. Estimated actuals reporting interface: Put all the information needed for adjusting estimated actuals in one place so you can adjust the ACWP total until you are satisfied with the estimated actuals being written into the system. Update forecasts in grid view: With grid view, Project Leads can update the labor forecast directly in the tool and use the forecast validation analysis view to review the validity of the forecast data. So you'll see if there are problems with specific takeoffs (earned and no actuals or actuals and no earned). Integrates in one direction with MS project and Primavera. Inadequate bolt-on application to import BOE, BCR and WAD forms. Quickly establish a budget baseline by Importing estimate data from BOEMax. Make rolling wave planning a cinch. by making updates in BOEMax and pushing them to EVMax. We help you set up your systems so that reporting requirements can be adequately met, including IPMR reports as well as workflow authorizations to include change control, variance analysis reports and forecasting.